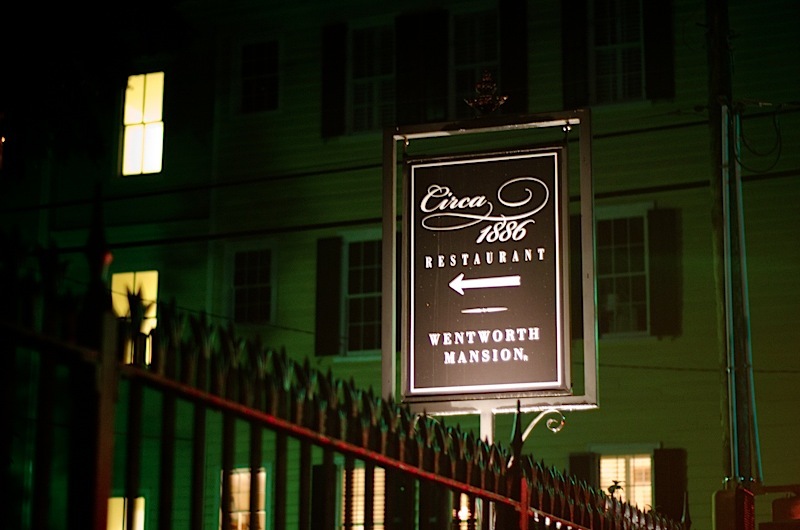 Our hotel confirmation email recommended that we make a reservation with Circa 1886, a restaurant on the grounds of the Wentworth Mansion that our hotel seem to be affiliated with. 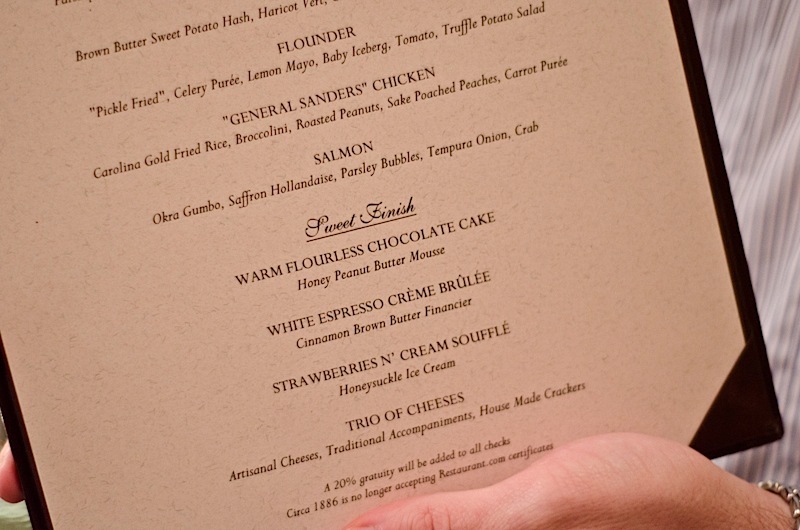 The email told us that we were able to score a special three course meal for $42. 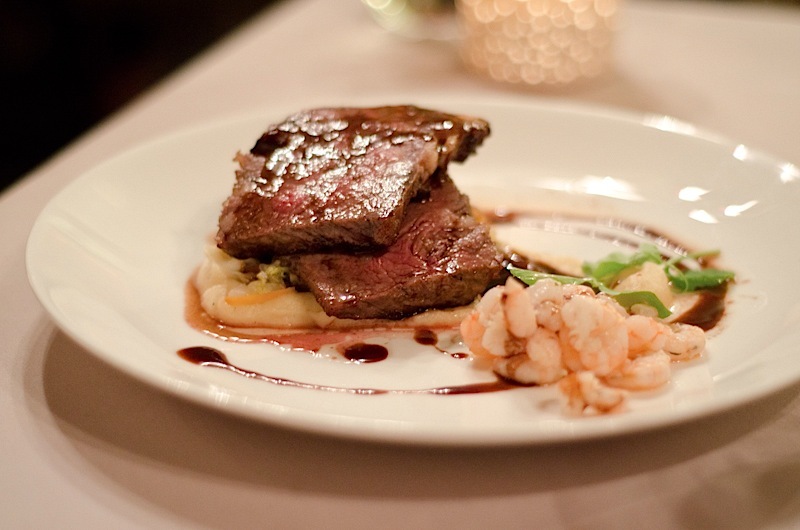 As it turns out, we were in Charleston just in time for Charleston Restaurant Week, so we were also able to get a three course meal for $40. 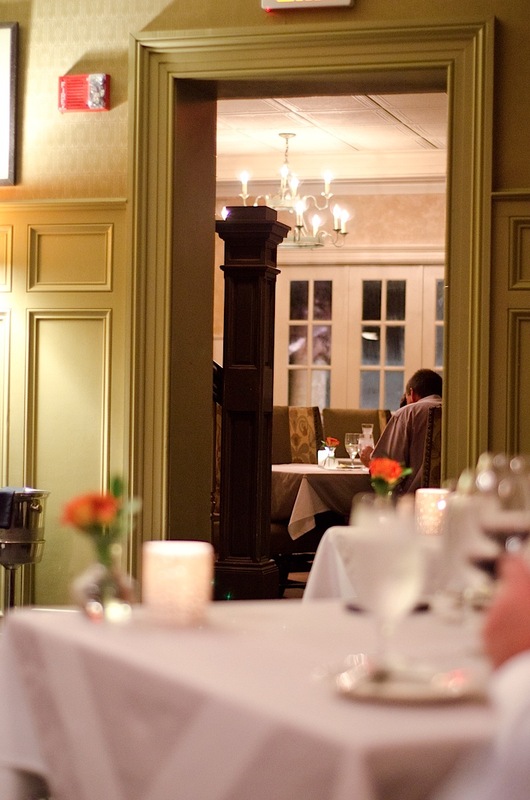 After a little online research and finding lots of positive reviews, we made reservations. 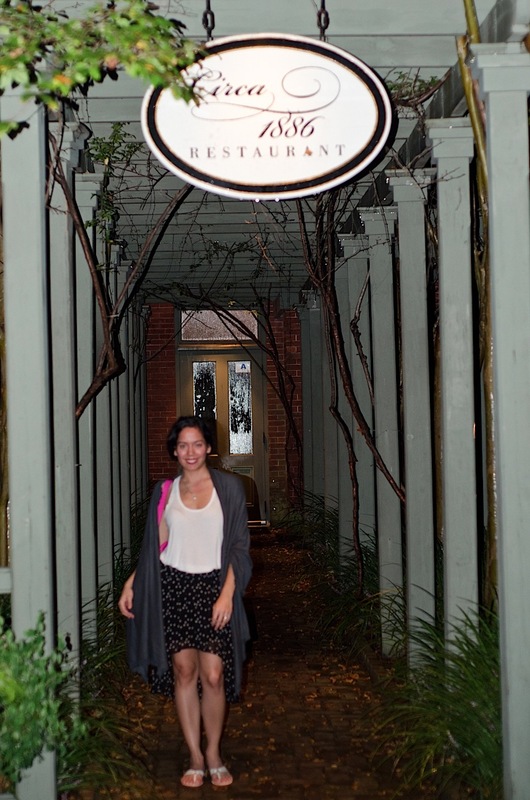 I was really excited to try the food since the restaurant has a focus on utilizing local and seasonal ingredients. The restaurant was about a 15 minute walk away from our hotel. Luckily, I packed 0 heels and plenty of flats, so the walk was a piece of cake. The restaurant had a nice selection of cocktails. It was a tough choice, but I ordered the Pomegranate Limoncini (I think that’s the name) to drink. 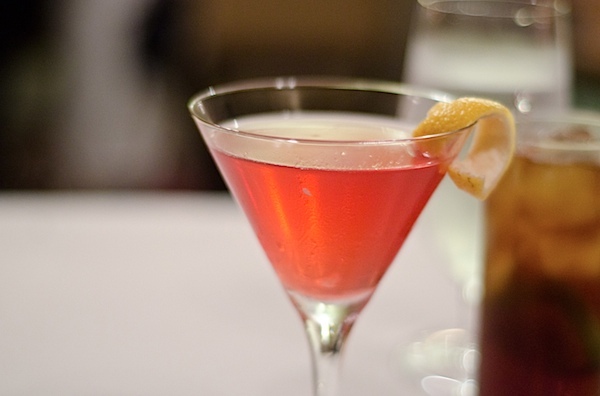 It was a delicious mix of pomegranate liquor and limoncello. 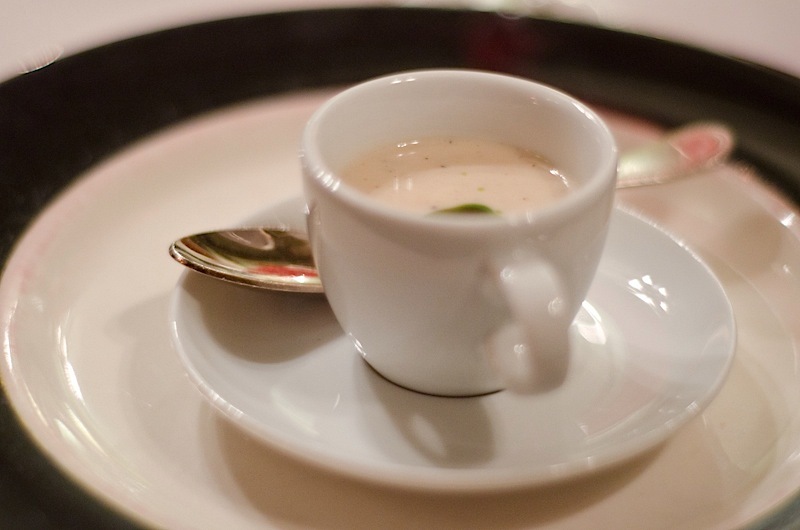 Our meal started with a mini cup of creamy cauliflower soup with a watercress topping. 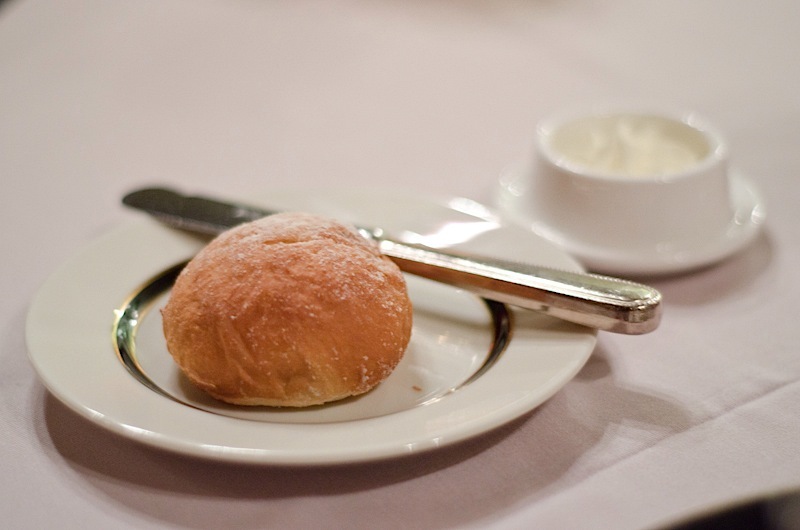 We also enjoyed rice flour dinner rolls. 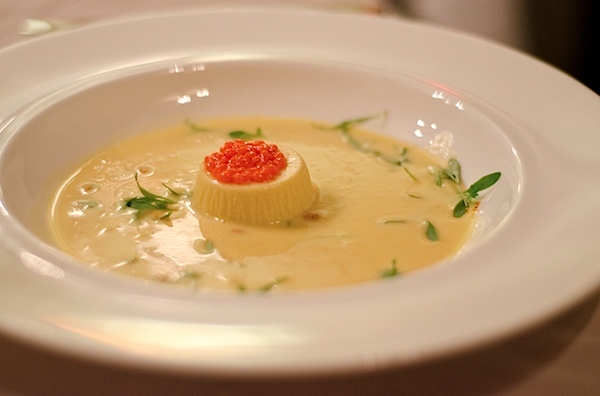 For our first course, hubby chose the Corn Hot/Cold – (from the menu) “Chilled John’s Island Corn Soup, Smoked Corn Custard, Red Pepper Caviar, Cilantro, Chili Powder, Corn Dust”. The dish was served with just the custard plated, and our waiter poured the corn soup into the bowl at the table. I love an interactive dish. Hubby let me have a taste, and I almost stole his plate away because I liked it so much. I especially loved the fresh, baby cilantro against the sweet corn. 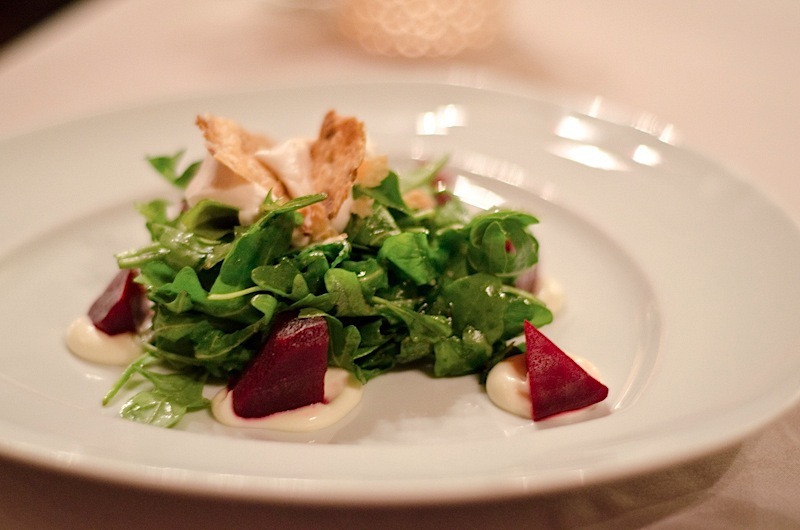 I chose the Local Beets for my first course – (from the menu) “Goat Cheese Aioli, Pecan Buttermilk Crackers, Bliss Maple Vinegar Cloud, Arugula.” I definitely knew I wasn’t “in Kansas” any more with this first dish. I’ve never had a “cloud” of anything, and I was intrigued by the menu descriptions. The small details, carefully thought out flavor pairings, and attention to texture culminated into an almost art-like dish (on all the courses, not just the starter). I almost didn’t want to eat it, it was so pretty. Not really. I was too excited to try it to wait very long. I dug right on in, and it was just as delicious as I expected. …enter – the best fish I’ve ever had. Ever. Now, I know I’m not a big fish/seafood person, but this fish was absolutely stunning. 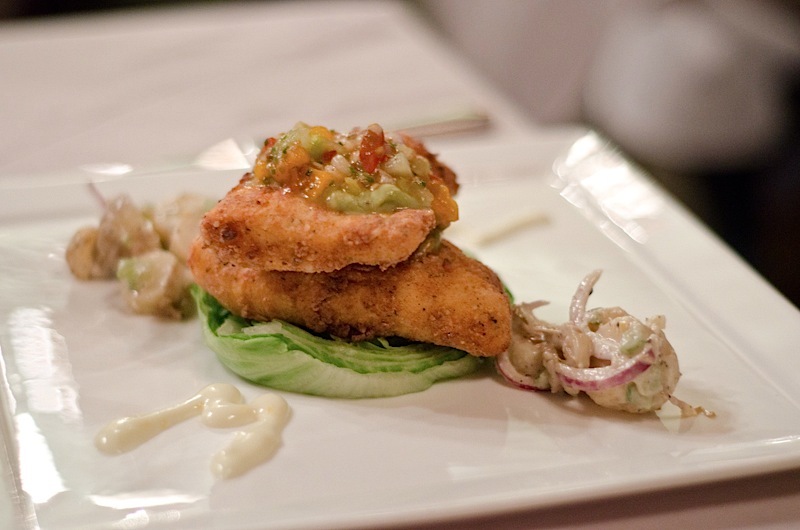 Hubby ordered the Flounder – (from the menu) “‘Pickle-Fried’, Celery Purée, Lemon Mayo, Baby Iceberg, Tomato, Truffle Potato Salad.” The fish was lightly battered and had the perfect amount of crispy-crunchy texture against the tender flounder. Each bite was a pleasure to eat, but it was the flavor that I loved the most. The batter really did remind me of fried pickles, and it had a distinctive bite to it thanks to celery seed. I wasn’t sure at first if it was really celery seed I tasted, but I asked our waiter who checked with the chef, and sure enough – it was celery seed. Now, the fish would have been great on its own, but paired with the topping, it was perfection. I may not have taken hubby’s corn appetizer, but I did end up with half of his entrée. 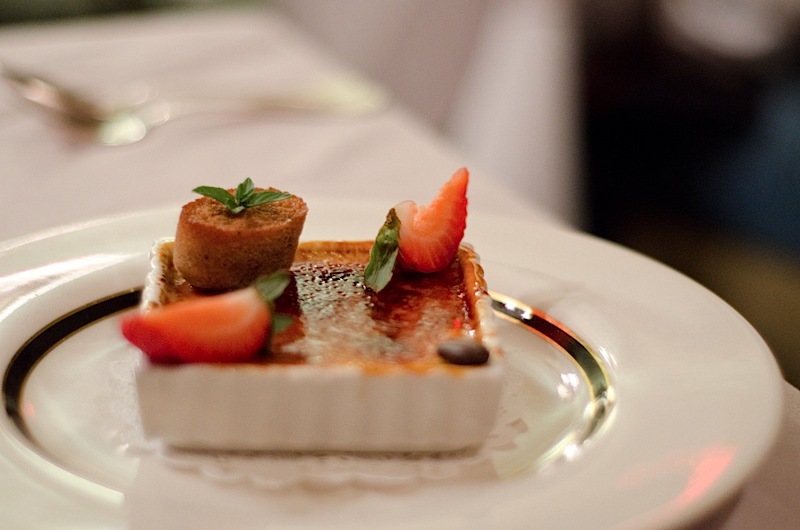 Hubby chose the White Espresso Crème Brûlée – (from the menu) “Cinnamon Brown Butter Financier,” which was a coffee-licious variation on the classic dessert. I went with the Strawberries N’ Cream Soufflé – (from the menu) “Honeysuckle Ice Cream.” I wasn’t sure how this dessert would be served – if there would be pieces of strawberry in the soufflé or if the strawberries would be on the side and deconstructed. 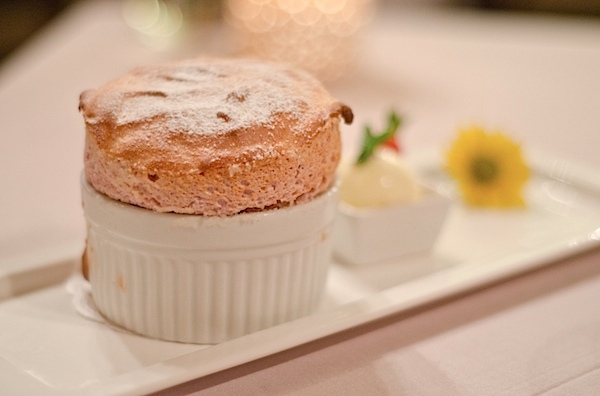 It appears that the strawberries were blended into the soufflé batter because the soufflé had a touch of pink color and a smooth and airy texture. The ice cream went wonderfully with it. The whole dessert was a great way to end the meal – it satisfied my sweet tooth without being overly sugary or heavy. I think I could eat one of these every day. Thank you Circa 1886 and Chef Marc Collins for the delicious birthday meal. We loved your modern take on classic Southern fare. We’ll definitely be back! Reader question: What’s the best fish you’ve ever had and where did you get it? Or, what’s your favorite kind of fish? Glad you had a happy birthday- Looks delightful! I love Charleston. My parents were there with you this weekend celebrating their 53rd anniversary! Wow! Congrats to your parents, Mary! 🙂 That’s wonderful! Hope they had a great anniversary weekend.